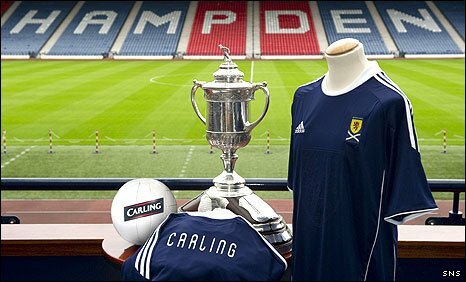 The Scottish Football Association has signed a four-year sponsorship deal worth £2m with brewers Carling. The company, which recently ended its sponsorship of Celtic and Rangers, will become a sponsor of the national team and official beer of the Scottish Cup. Brewing company Tennent's ended its 36-year relationship with the SFA in May. George Peat, president of the SFA, said: "This is an original and exciting deal and the Scottish FA is delighted to be in partnership with Carling." And he added: "It has been a major supporter of Scottish football for a number of years. "We are confident that the wide range of sponsorship opportunities made possible by this deal will enable the Scottish FA to engage with fans across the full spectrum of our responsibilities, with the national team and the Scottish Cup and also with our many events at the National Stadium." Carling's seven-year sponsorship of the Old Firm ended this year. The company announced a three-year deal to become the official beer of Scottish Rugby and Murrayfield Stadium in February.